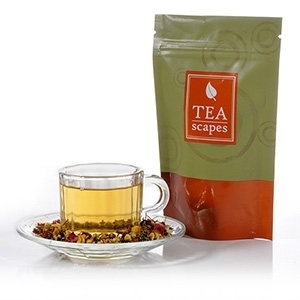 This organically grown tea starts with a roasted rice aroma and finishes with a fruity taste, blending beautifully with the warm fresh ginger and refined Turkish rose. 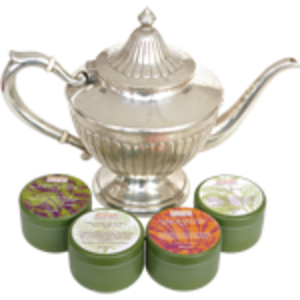 My collection of perfumed teas grew out of my love for oolong tea — its complexity and beauty is like a perfume in itself. Essential oils and absolutes are layered onto this exquisite base of first-quality leaves to create a beautiful, subtle taste and scent experience. This is so PRETTY!!! You’ll have to see it or SMELL it for yourself to believe it! Everything about this tea shouts CLASSY! 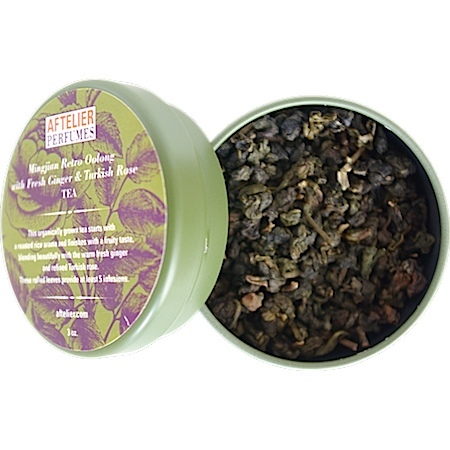 Ti Quan Yin Oolong with Fresh Ginger and Turkish Rose from Aftelier Perfumed Teas is a truly unique sipping experience! But the fun doesn’t stop there! This tea awakens ALL of the senses! The Before Infusion Aroma is very fragrant and beautiful. The first thing that came to mind was…A Rose is a Rose is a Rose! The Post Infusion Aroma was that of a Rose and Ginger Combo. The Taste was a nice flavored oolong! The rose and ginger flavors seemed to have met in the middle which I really appreciate. The Aftertaste was even floral! This was brilliantly done and very enjoyable -not to mention – memorable! It holds up well to multiple infusions, too! Smells just like the first blossoms of spring. Fresh, yet mild, real lilac petals bring this fragment flower right to your taste buds. Lilacs remind me of my gramma. She had a big, beautiful lilac bush in her backyard, and every spring as it came into bloom her yard became such a lovely, fragrant place to spend the afternoon. Since that time, lilacs have come to mean springtime to me, and the source of many happy memories. This tea brings those memories to life right here in my teacup! The dry leaf of this black tea is alive with color, thanks to a generous sprinkling of lilac petals. 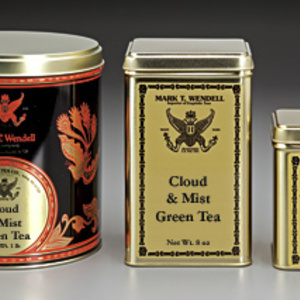 They add a beauty and a charm to this tea … not to mention a delightful fragrance! 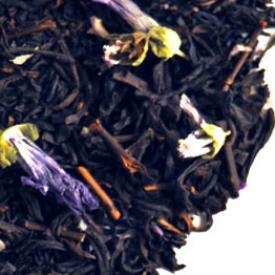 The black tea base is a brisk, bright tasting black tea. It isn’t an overly aggressive black tea. There is a light, drying astringency to the tea. Overall, the tea is fairly mellow, and adds a smooth tranquility to the overall flavor of the cup, making this a pleasing afternoon tea. The lilac flavor is rather unexpected! Of course, I knew that it was a “lilac” tea, but I don’t really recall ever having tasted lilac tea before, so, I didn’t know what to expect from it. It has an enchanting, sweet floral flavor to it. In trying to grasp for a way to describe the flavor … the word I come up with is serenity. It is a very serene, relaxing tea, and I have enjoyed it immensely, as well as the memories it has evoked. Thank you, Element Tea, for this amazing trip down memory lane! Lush and inviting, Raspberry Champagne blends the floral, honey-like notes of champagne with fresh, blushing berries. 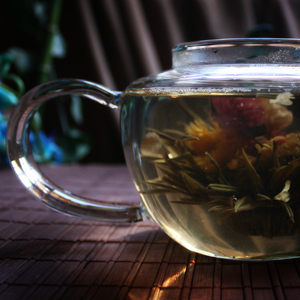 White tea is said to be the healthiest of all teas and is picked only a few days each year. 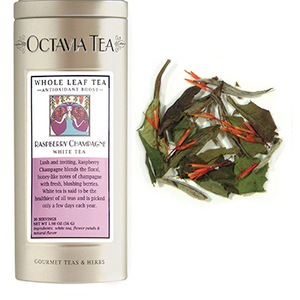 Raspberry Champagne from Octavia Tea smells like Raspberry and Flowers! The taste is Raspberry and floral but very champagne-like and juicy. The aftertaste is a sweet floral taste. The berry notes are wonderful! I can even taste a bit of honey as well! I tend to over infuse my loose leaf teas. I infuse more of the actual loose leaf but for a little less time to avoid bitterness or overly grassy or mossy tastes in other teas. The aroma was of Honey, Berries, White Tea…it was very nice! The taste was pretty much the same as before but even more so. The Raspberry really came out when I attempted this! I also tried a 2nd infusion when I over infused the amount of loose leaf and the taste is a bit on the lighter-side…but still very tasty and satisfying. I really enjoyed each attempt! And I really thought this was a great flavored white tea!